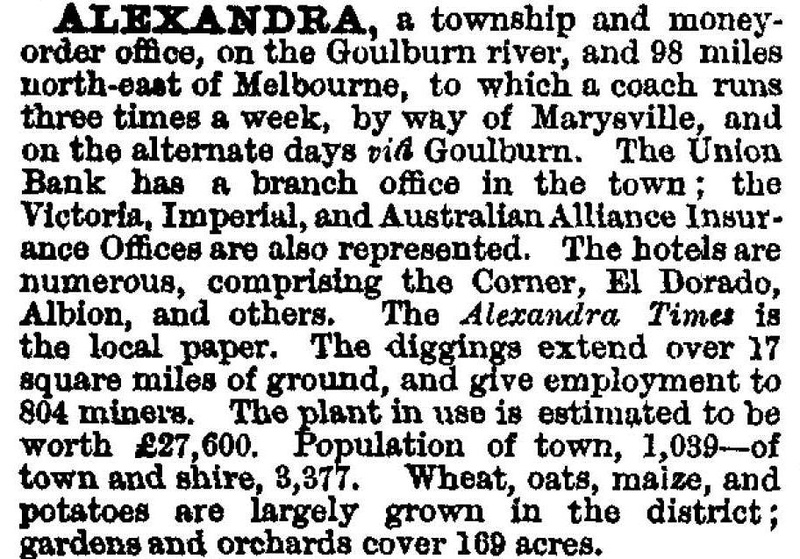 Alexandra is a town (and until 1994, a shire), 90 km north-east of Melbourne. Until 1866 Alexandra and the surrounding district was occupied by squatting runs. In June of that year two employees of the Mount Pleasant Run found a quartz reef about two kilometres south-east of the future site of Alexandra. Other gold-bearing locations were discovered soon afterwards, a notable one being along the UT (Ultima Thule) Creek, a tributary of the Goulburn River. There was also a track to other diggings along which supplies were brought, and the track passed through a red gate in the boundary between squatting runs, the boundary more or less following the UT Creek. Red Gate became a small township on UT Creek until named Alexandra in about 1867 after the Princess of Wales or the given name (Alexander) of the discoverers of gold in 1866. 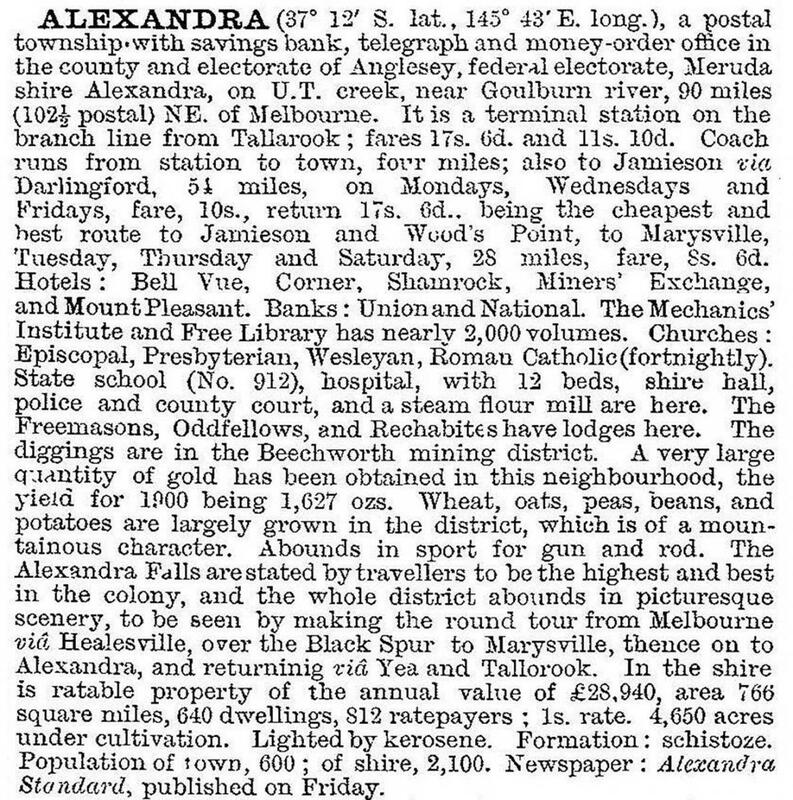 Alexandra was awkwardly located for connection by railway to Melbourne. It could have had a direct line via the difficult Yarra Ranges or a spur from the Melbourne to Mansfield line. It achieved the latter in 1909. The line was seldom profitable, depending on freight from timber. Tourism was active, particularly in the shire's southern areas of Buxton and Taggerty, but most tourists came by road through the ranges. The town had lodges, churches, a library and a mechanics' institute, but had lost about 40% of its population since 1875. The shire's population had declined by about 15%. In the early postwar years plans were made for enlargement of the Sugarloaf Dam, and in 1955-56 the new dam (Eildon) was completed. The dam was in the neighbouring Mansfield Shire, and the new township of Eildon in the Alexandra Shire. Alexandra was situated in the north-central part of its shire. Other towns (going from north to south) included Gobur and Yarck, and south of Alexandra, Thornton, Snobs Creek, Eildon, Taggerty, Rubicon, Marysville, Buxton and Narbethong. Snobs Creek is the site of a trout hatchery. Also in the south of the former shire are the Eildon and Cathedral Range state parks and the Lake Mountain snowfield. In 1994 Alexandra Shire had 29,500 meat cattle, 1150 dairy cattle, 47,000 sheep and 8500 lambs. Farming occupied 25.9% of the shire's area of 2197 square kilometres. The Alexandra township has a full range of facilities, including a Catholic primary school and State primary (198 pupils in 2014) and high (1953) schools (295 pupils in 2014), a hospital, sports venues and a swimming pool, hotels and camping grounds, a museum with a timber tramway, a racecourse and an annual agricultural show. Its population rose during the 1980s, as did the shire's. The railway line into Alexandra was closed in 1978, but road transport had carried most travellers and freight for some time. On 18 November 1994 the Alexandra Shire was united with Yea Shire, parts of Broadford, Eltham, Euroa and Healesville Shires and part of Whittlesea city to form Murrindindi Shire. The shire is headquartered at Alexandra.